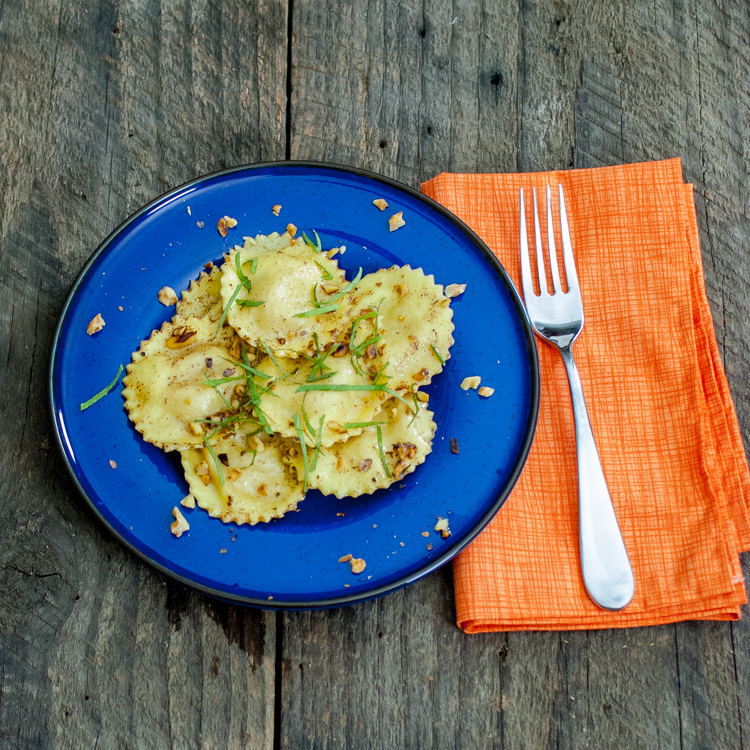 Butter Nut Squash Ravioli are certainly a craving of mine this time of year. The winery’s up the road are close to wrapping up the harvest for the year and pressing grapes into wine. It is getting noticeably cooler and realizing I need to adjust the thermostat. The garden is about done, and last night after we returned from Seattle we went through and picked the last of the goods. This coming weekend we are planning to start our winter garden and clean up the mess from our summer garden. As the weather cools, I find my self craving sage, nutmeg, squash and roasting things in the oven to warm the house on the weekend. I have to say out of all the verities of squashes out there, butter nut is my favorite. 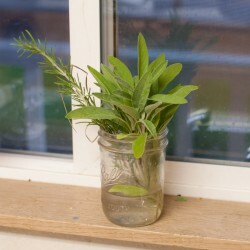 I am actually a little sad that I didn’t think of trying to grow some this year, although I will be sure to next year. Luckily the organic section of our supper market is in no short supply. I don’t know who decided to put the rich creamy texture of the butter nut squash into the insides of a ravioli, but they should be thanked. Some time ago I had the chance to have some amazing butternut squash raviolis in an Italian restaurant in Sellwood and ever since, I have been on the hunt for some more. Unfortunately they really are not that common to find, I have found out over the last 10 years. Well I guess I just needed to take matters into my own hands. So after several attempts (yes, with less than desirable results) I feel my patience has been rewarded (Delicious Butternut Squash Raviolis get into my mouth)! With a wonderful fall flavor profile of roasted butternut squash, nutmeg, roasted walnuts, fresh sage, romano cheese and tossed in a brown butter sauce um… Yummy, I bet you can’t wait to dig in. I know I couldn’t wait another 10 years. Pour semolina flour onto a board or counter, use hand and create a well in the center. Crack eggs and place water in to well. Beet eggs and water in well and incorporate semolina flour. Kneed dough and wrap in plastic wrap and rest in refrigerator for 2-24 hours. Cut dough in half and dust counter with all purpose flour and roll out into long 1/8" pieces. 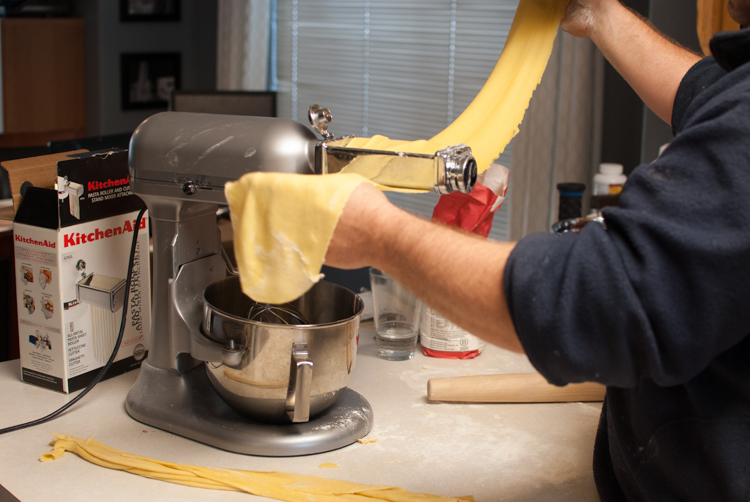 Run dough through a pasta maker at setting 5. 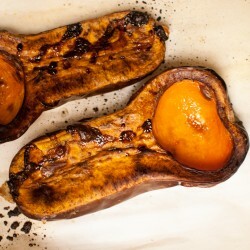 Cut butternut squash in half and place on sheet pan lined with parchment paper. Roast on 425 degrees for 2 hours. Scrape flesh out into food processor and add nutmeg. Pulse until pureed. You may have to add some liquid if to firm. Add to plastic Zip-Lock bag. 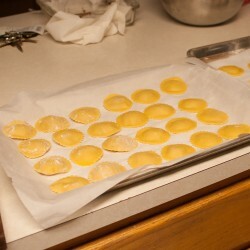 Lay one sheet of the pasta out on a flour dusted counter top. Cut a small tip off on corner of the filling bag and pipe out quarter size dots out onto the pasta. Carefully with a silicon or regular kitchen brush, brush between the filling with egg wash. Be very careful not to touch the filling with the brush, because the filling will not let the pasta seal correctly. Place second sheet of pasta carefully over the top and carefully push air out around fill with out squishing it out. 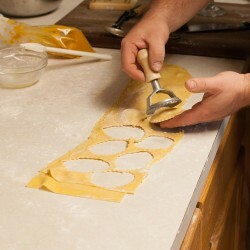 Use ravioli cutter to cut out individual raviolis out. Run fingers around each ravioli in a pinching fashion to seal each individual ravioli and place on flour dusted parchment paper. In a large stock pot 3/4 full of boiling oiled and salted water add raviolis. Boil for 6-8 minutes and remove with a slotted spoon. In a sauce pan melt butter over medium heat until brown. 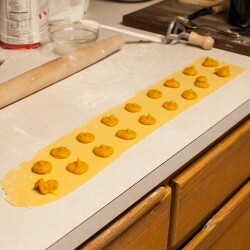 In a large bowl place brown butter raviolis and toss gently. Plate and sprinkle sage and romano cheese over top. Eat!!!! These look delicious! I made Butternut & Cashew Ravioli with a fresh sage pasta a few years ago for Vegan MoFo (that I hope to someday retool and repost on my actual food blog), but I did not have a cool pasta thinger for my mixer when I made them back then – we rolled them out by hand! OMG, never again!! A pasta machine of some kind is definitely a necessity as far as I’m concerned! Thanks for stopping by Renee!…yes, definitely a must for pasta, it’s a life saver! Can you cook the squash ahead of time and refrigerated till you were ready to make the ravioli? How many eggs do you add? Your recipe only says 1 egg white and an egg wash, but the picture shows several whole eggs. 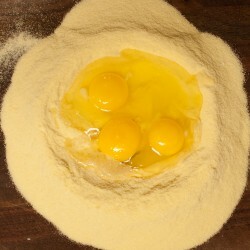 Just one egg is used, the picture shows the recipe was tripled.